It’s a couple days before Christmas, I’m at Grand Central Station, and there’s some time before the train to Connecticut. Not a lot of time, but some time. Enough to grab a drink. There’d been some drinking the night before, so I didn’t want another glass of wine. I just wanted something to sip while I waited, so I ordered a Scotch. 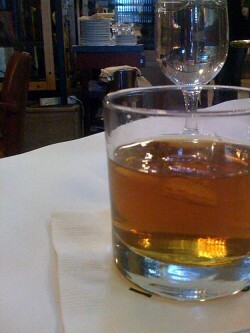 Glenlivet, with one ice cube. It’s got to be $40 worth of Scotch that they gave me for $12. I’ve thought about it for a while, and I can’t figure out which one is the answer. 3. The bartender assumed the Scotch was for the gentleman next to me. When the waiter arrived, he placed the wrong drink in front of me. “Champagne for the lady?” he said, with a flourish. Nope. Champagne for the gentleman. It was one of those moments where I’m hoping it comes off all cool, but inside I’m mortified that it looks like I have an actual drinking problem. Whatever the bartender had in mind by pouring half a bottle of Scotch into a glass, I mostly felt bad that I barely put a dent in it by the time I had to leave for the train. Not that I didn’t give it my best shot. It was one of my better Christmas presents this year.